Data released by government shows rural health inflation was at 10.14 per cent in December 2018, more than double since September 2018. New Delhi: India has seen a steady rise in health inflation over the last few months, especially in rural areas, raising concerns that the Narendra Modi government’s flagship health insurance scheme, Ayushman Bharat, may be fueling a price rise. Data released by the Ministry of Statistics and Programme Implementation Monday shows rural health inflation was in double digits at 10.14 per cent in December — 7.1 per cent for urban areas — while the combined health inflation was at 9.02 per cent. In November, rural health inflation was at 7 per cent, urban health inflation at 7.38 per cent and overall health inflation was at 7.16 per cent. The corresponding figures for October were 8.05 per cent, 7.58 per cent and 7.92 per cent. 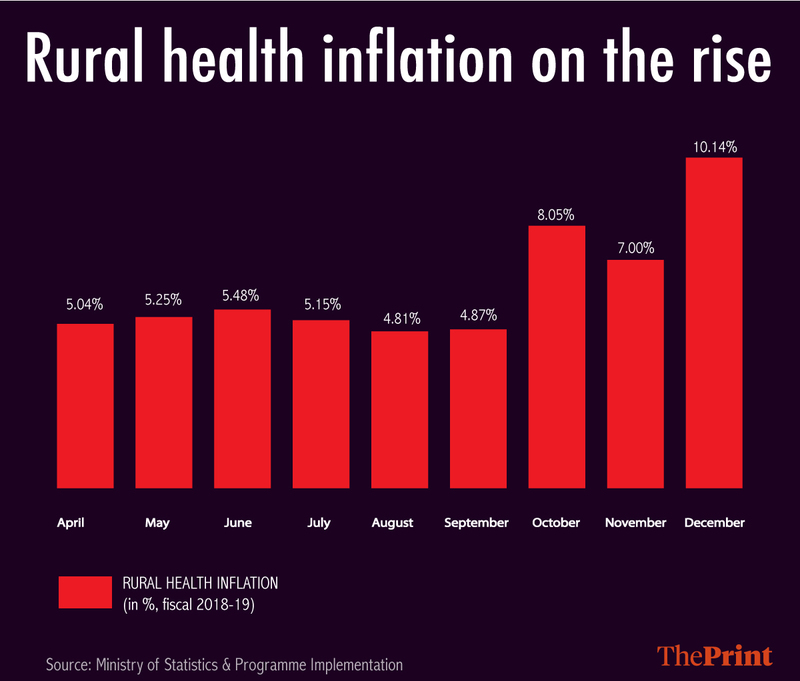 Before October, rural health inflation was in the range of 5 per cent from April through September in the 2018-19 fiscal. The rise in health inflation comes at a time when the overall retail inflation has fallen to 2.19 per cent in December and food inflation has fallen to a negative 2.51 per cent. Ayushman Bharat was launched by the government last year with an aim to provide health insurance coverage to 10 lakh poor and economically backward families. The government estimated that nearly 50 lakh Indians will benefit from the scheme. It was rolled out from 23 September. An upgrade in rural health infrastructure as well as higher health bills may be some of the reasons for the increase in health inflation, say economists. They add that given the weak rural demand, this increase is even more puzzling. Economists point out that this could also reflect the moral hazard problem associated with such schemes wherein health bills are inflated by hospitals since they know patients have an insurance coverage. “Strangely, and that defies all logical explanations, core CPI inflation increased to 5.73% in December ’18 due to huge jump in health (9.0%) and education (8.4%) inflation. The most puzzling aspect of the inflation data is the increase in rural health and education inflation at the time when rural demand is collapsing,” Soumya Kanti Ghosh, Group chief economic advisor at State Bank of India, said in a note Monday. Education inflation in rural was areas was at 9.92 per cent in December. 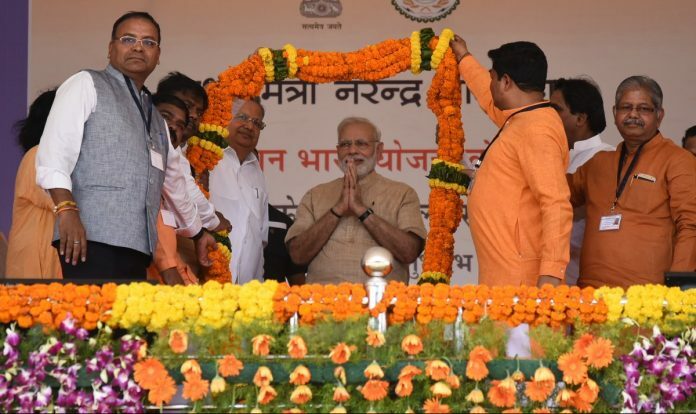 Ghosh said the increase in health inflation could be due to a combination of methodological changes in data collection and implementation of Ayushman Bharat which might have led to an upgradation of health services at least in rural areas. “However, even then the jump in healthcare costs is happening mostly because of jump in medicine costs from non-institutional sources, that begs explanation,” he added. Devendra Pant, chief economist and head public finance at India Ratings and Research Pvt. Ltd, said high rural heath inflation levels were last seen in a few quarters of 2011-12 and 2012-13. “The recent rural health inflation trends have been low at around 5 per cent. But from October, rural health inflation has seen a steady rise,” Pant told ThePrint.